The built-in cable length of this controler is longer than the 70cm cable length of the standard Controller that came supplied with your Console (more than double the length), so that you can play in comfort without having to sit so close to the TV. While the built in cable of this controller is very long, and is suitable for most needs, the cable length can also be extended by a further 1.8 meters (making it total a whopping 3.6 meters, which is more than 10 feet long) when used in conjunction with our Orzly Cable Extensions (sold separately). 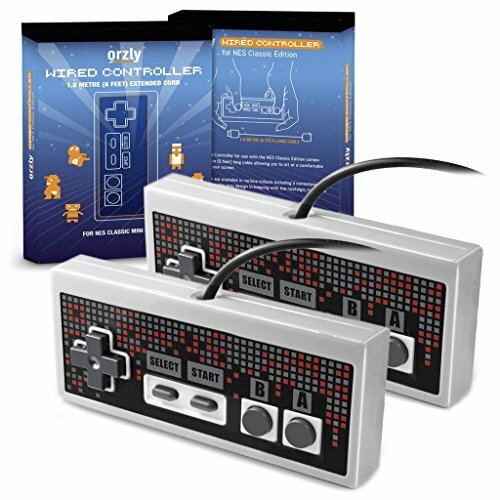 For our compatible cable extensions, simply search "ORZLY NES EXTENSION" on Amazon and check that it has Orzly in the product title to ensure compaitibility. *PLEASE NOTE: THE CONSOLE SHOWN IN IMAGES IS FOR USAGE DEMONSTRATION PURPOSES ONLY AND IS NOT INCLUDED WITH THIS PRODUCT. LONGER CABLE: This cable is longer than the 70cm cable length of the standard Controller that came supplied with your Console, so that you can play in comfort. Make it even longer with the Orzly Extension Cable (sold separately). RETRO DESIGN: This controller has been designed to be in-keeping with the nostalgia of the NES and its resurrection from all its former glory! The Orzly controllers are available in the classic grey design or a contemporary black finish. If you have any questions about this product by Orzly, contact us by completing and submitting the form below. If you are looking for a specif part number, please include it with your message.